The start of the 2018/19 season has been a pretty dreadful one for Manchester United. The club had a poor summer window, and failed to address a number of issues in the team. Man U did win their opening contest of the season at home to Leicester City, but have gone on to give up three goals in losing efforts against both Brighton and Spurs. It seems like there’s tension between manager José Mourinho and the higher ups at the club, which might not be resolved anytime soon. However, in any moment of darkness, there is a silver lining to be found. For Man Utd, that beacon of light has been Luke Shaw. Up to this season, Luke Shaw’s Manchester United career has been one of marvelous highs and devastating lows. Coming to the club as the world’s most expensive teenager at the time, the Southampton academy product quickly cemented a spot in the Man U starting XI. He was flying up and down the pitch, using his pace to help make key defensive stops while speeding down the wing to support the attack. However, Shaw suffered a brutal double leg fracture in a Champions League game against PSV that ended his season prematurely, and seemed to have derailed his promise. Once returning from the initial injury after 7 months on the shelf, it became difficult for the player to find a consistent run of games. He had to deal with setback after setback, and saw his left back position taken by older, more experienced players. One such player was Ashley Young, who did well enough to make the England team for the 2018 World Cup. In a strange twist of fate, Young’s time at the World Cup gave Shaw a perfect chance to reclaim his spot in the starting XI. As Young was resting up after helping England to the semifinals of the tournament, Shaw was able to participate in a full preseason with United. Featuring in almost every game of the summer tour, the player earned the trust of Mourinho, who gave him the start against Leicester in the first game of the season. Shaw took the opportunity with both hands, and doesn’t seem to be looking back. He couldn’t have dreamt a better way to start the campaign, as the Englishman went on to score his first career goal, which ended up being the game winner. There was not much he could do against Brighton, as the mistakes came on the other side of the defensive line. 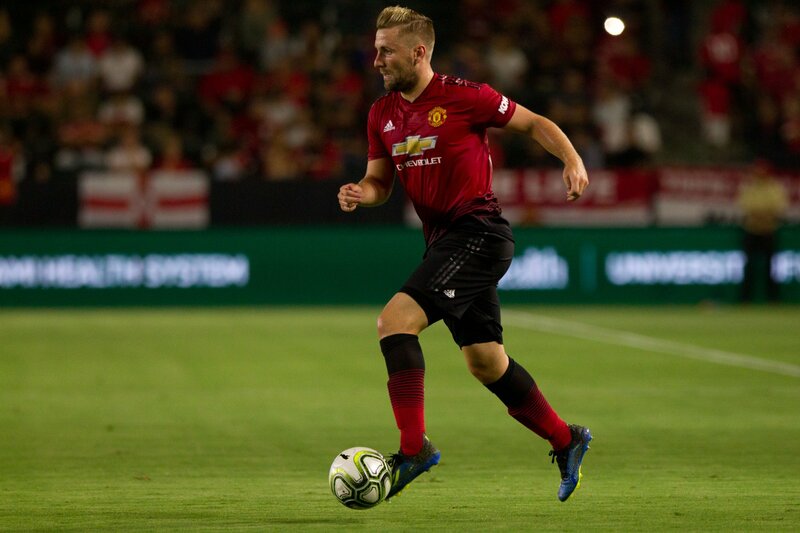 Although the end result against Spurs was not what he would’ve wanted either, Shaw was able to put in a great shift against a quality defensive side. He was able to get by Spurs and England right back Kieran Trippier several times over the course of the matchup, using his speed to fly down the wings. It was evident he was giving his all for the team, and even kept trying to run after suffering a minor cramp near the end of the contest. Twitter was overjoyed with his performance, praising Shaw throughout the game, and deservedly so. They weren’t the only ones proud of the player, as Mourinho made sure to comfort him at the full time whistle, and let him know he did well out there. Their relationship had been a difficult one in the past, but it now seems set to blossom out. Now, it is time for Shaw to build on these performances, and not only cement his spot in the United starting XI, but make a claim for returning to the England setup. The next few games for United will be against tough defensive sides, who prefer to sit back and absorb pressure. Shaw will be key in these matchups, as he will have to be creative going forward, but also prepared to defend on the counter attack at any given moment. Some fans had feared that the left back position would be one of bother for Manchester United this season. However, with Luke Shaw back at his best, the position is set to become a strong suit for the team.